I tried the Widder Mod, to see if that would allow a longer COL. The Widder mod seems to be intended to improve feeding of 38's, not to increase the COL. But nonetheless it looked like it might help. Basically the Widder mod converts the Marlin from a push feed to a controlled feed. 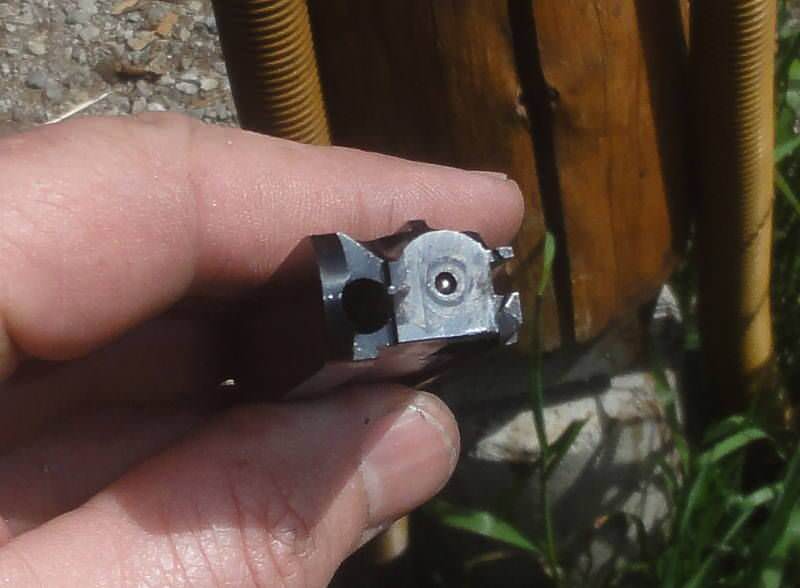 Also, after the Widder mod, the cartridge is supposed to be pushed by the bolt face rather than by the "nubs." The nubs protrude about 0.04" from the bolt face so that affects the timing of the action. So I tried the Widder mod, or at least I did the bolt mod part. I did not change the angle of the lifter as Widder did -- one thing at a time. 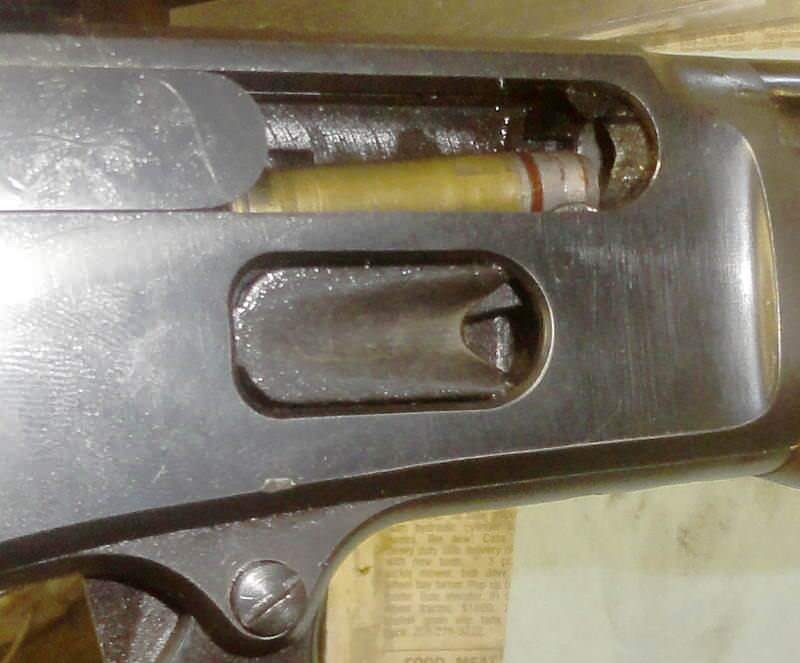 Sometimes the rim would slide under the extractor and be pushed by the bolt face, but other times it would still be pushed by the remaining lower nub, depending on how the gun was held. If it slid under the extractor then a 1.650" COL would chamber (barely). But if it was pushed by the nub, a 1.650" cartridge would slam the meplat against the breech before the carrier finished lifting. So the bolt portion of Widder mod was not a great success. 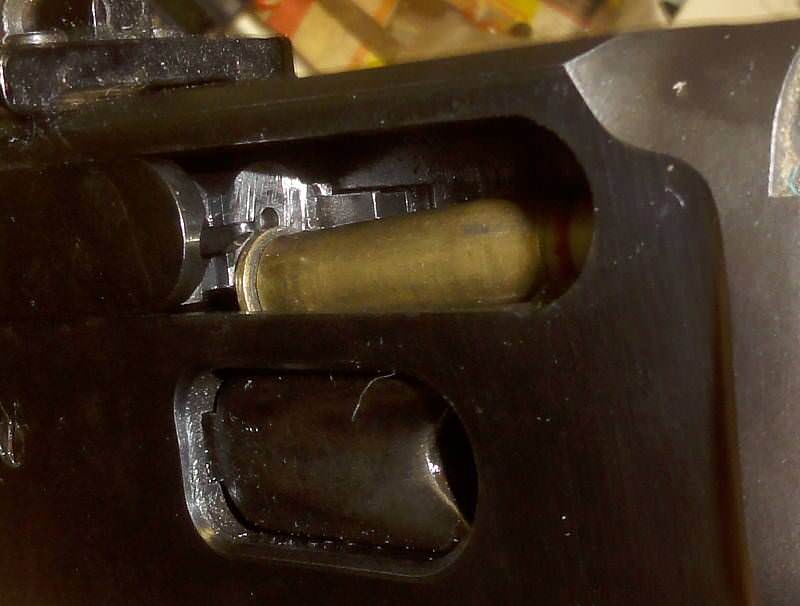 1.650" round jammed against breech because it was being pushed by the nub. After Widder mod, cartridge would sometimes be pushed directly by bolt face, and slide underneath extractor, like this. But it depended on how the gun was held. It's possible that removing more of the lower nub would make the Widder mod more reliable, but there may be some undesirable side effects? I decided not to chance it because the gains were too small to matter -- only 0.037" increase in COL compared to pre-Widder. Once again I am going to give up on stretching the COL because I'm just not seeing any big gains available. My existing pet load is 100% reliable at 1.613" COL. If there were some way to gain 0.1", that would be awesome, but I can't see jumping through a lot of hoops to gain a few thousandths. I found this thread that claimed 1.650" COL was possible merely by doing the carrier mod, but the author did not actually verify that a 1.650" COL would feed. He claimed to verify that 1.630" COL would feed, but he also said his bullet had a 0.330" crimp-to-nose, which if true would result in 1.615" COL, not 1.630". Whatever ! When I did the carrier mod I only got about 1.61" out of it with my bullets. No doubt there is some variation in max COL from one 1894 to the next due to manufacturing tolerances that affect the timing.